To install Prota OS on Raspberry Pi and configure your Prota Pi, follow the instructions detailed in this guide: Prota Pi Guide. Please note that Prota OS is a headless Operating System, so you can access it via our mobile app or web browser. You do not need to use a mouse, keyboard, and monitor. Prota OS is free and can be downloaded here if you want to install it on your Raspberry Pi. We are supporting a free Raspberry Pi version as we believe that the community of makers has the capacity and passion to shape what's going to be the next big thing in the IoT universe. This OS will, therefore, remain free. In a near feature, we will give the possibility, in exchange of a small subscription fee, to get additional features and apps. Of course, you will have the choice to keep the free version only. We created a single Prota OS image that is compatible with multiple versions of Raspberry Pi: Rpi B, B+, 2, 3 and zero W version. You can use Prota OS on as many devices as you want. 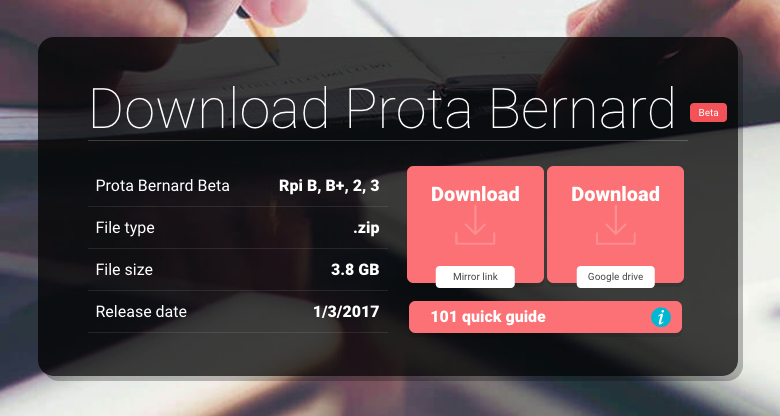 Prota OS is available to download here. To write the image on your SD card, we advise downloading "Etcher". Make sure you are using a 16Gb SD card at least to allow Prota OS to run properly.